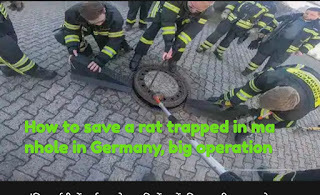 Omg..How to save a rat trapped in manhole in Germany, big operation. Learn how to get trapped in the mouse manhole in a city of viral, then how the firebird team saved them. There was a 25-minute operation to remove a mouse trapped in a manhole in Germany. After the successful campaign, when the Fire Department saved the rat, he was appreciated. This case belongs to the Mannheim city of Germany. This rat was trapped in sewer. Animal rescue worker Mishaal Sehar told the news agency DPA, "There was a lot of" winter fat "on the rat, due to which he was trapped in the hole, after trying so hard he could not get out." As soon as people saw this rat trapped in a manhole, his photographs started getting viral on Germany's social media. After seeing these pictures, an animal rescue organization "Berufstereratung Rhine Neckar" tried to remove it, but failed. Then they called for a local volunteer fire department to help about 30 kilometers away from Mannheim city. 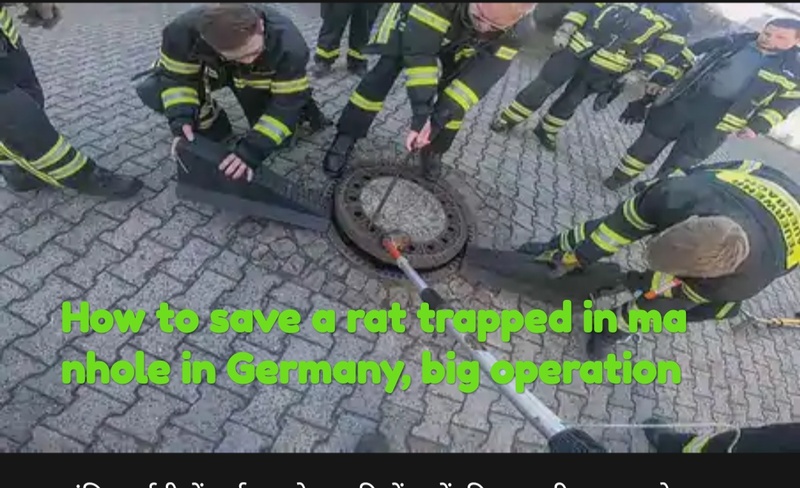 The team of eight firefighters who reached there lifted the heavy manhole cover and then safely pulled the rat out of the hole. There is no harm to the rat.The mouse was again abandoned in the jungle. The operation of the Fire Department continued for 25 minutes." Animal Rescue Group "Berufsterertung Rhine Neckar" posted photos of this operation on Facebook. There were thousands of responses and hundreds of comments on social media platforms. Many people praised the work of the rescue team and fire department. One wrote, "I think it is very good. Every creature should get help." 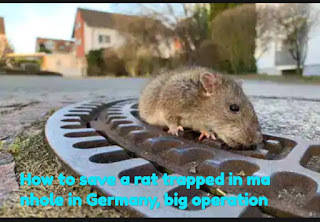 The rest of the people said on Facebook that the step of saving the rat is in contrast to the efforts of mice in other German cities. Although many areas in Germany these days they are campaigning to reduce the population of rats. Western German city Dortmund has started a campaign to reduce the population of its rats by putting poisonous fodder in sewer.